Whether it’s utility bills, business documents or contracts - these days we want to store our data digitally and have access to it instantly. With the ADS-1200 portable document scanner, you can make this possible. Fast 2-sided scan speeds of up to 25 pages per minute and a 20-sheet automatic document feeder, the ADS-1200 offers big performance in a small package that will easily fit into any office. Scanning 2-sided multi-page documents have never been easier. Using the ADF, you can scan 25ppm with ease. Whilst a dedicated card slot comfortably handles plastic ID cards, so your records can be easily kept up to date. Spend less time waiting for your files and scan directly to a USB stick. Designed with flexibility in mind, the portable sheetfed ADS-1200 can be powered using USB 3.0 connected to a laptop or compatible device. You can now take your scanner with you, scanning when it’s most convenient. 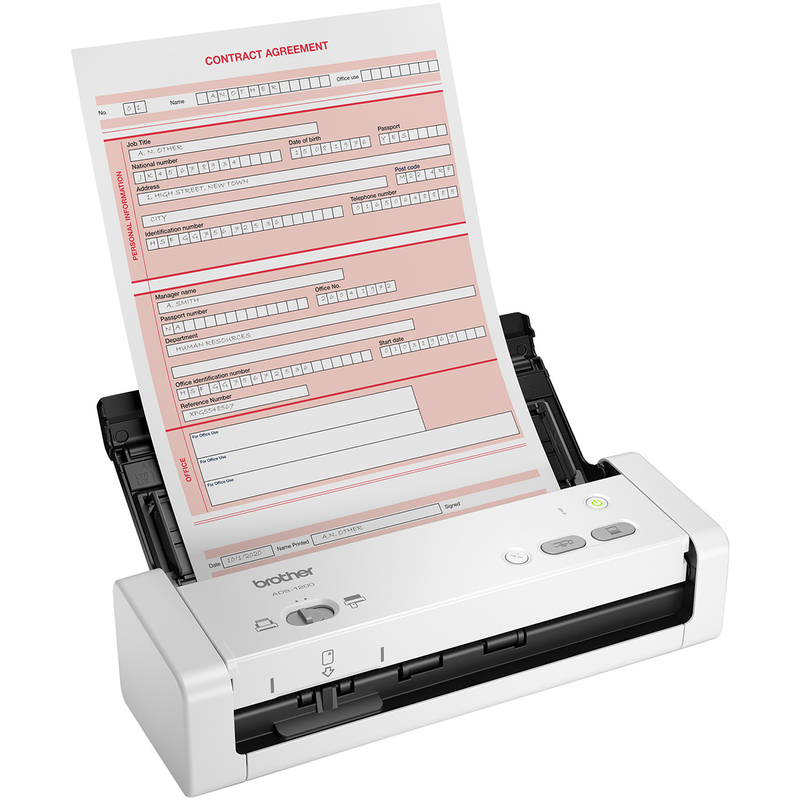 The ADS-1200 compact document scanner is ideal when space is limited. Measuring slightly wider than a sheet of A4 paper, you can free up desk space and reduce clutter. The ADS-1200 comes tried and tested with Brother’s unrivalled product support and reassurance. So whether it’s a few documents here and there or piles of paperwork that need digitising, you’re sure to find the perfect fit for your needs with the new ADS-1200. ADS-1200 Desktop Scanner, AD Adaptor, Quick Set Up Guide, Product Safety Guide, Warranty Documentation.